When selecting companion trees to grow near a specimen bald cypress (Taxodium distichum), choose trees that prosper in the same climate and excel in the same moist, acidic and fertile soil bald cypress trees need. This ensures all trees grow healthy and to their greatest potential. Also avoid planting trees too closely so that decades from now they don't crowd or shade each other out. Visual interest occurs when contrasting shapes exist in proximity, allowing the eye to see an amplified display of differences. The tall, upright pyramidal shape of a bald cypress looks wonderful when it is repeated in a cluster of other bald cypress trees. The use of nearby trees that are more oval or rounded and spreading accentuates the inherent beauty of the spire-like bald cypresses. For example, an oak (Quercus spp.) or maple (Acer spp.) creates a large, rounded shape that would heighten the vertical shape of nearby bald cypress trees. Even plump, round-shaped trees like lindens (Tilia spp.) or ashes (Fraxinus) in the background look attractive. In warm winter regions, the mop-head foliage and stark trunks of a cluster of palms makes a bald cypress tree look lush and fluffy. An example is the use of cabbage palm (Sabal palmetto). Bald cypress foliage is lacy and feathery and turns rusty orange in autumn before it drops away. Imagine the heightened effect with dark evergreen trees behind a bald cypress. A southern magnolia (Magnolia grandiflora) bears large glossy dark green leaves that persist across winter. Even a holly (Ilex Americana, Ilex aquifolium) or cedar tree (Juniperus spp. and Thuja spp.) provides an evergreen backdrop of a different color when the bald cypress is not barren. Avoid planting other fine-textured trees like larch (Larix spp.) or many legume-type trees like honey locusts (Gleditsia spp.) since minimal leaf contrast exists with the bald cypress. 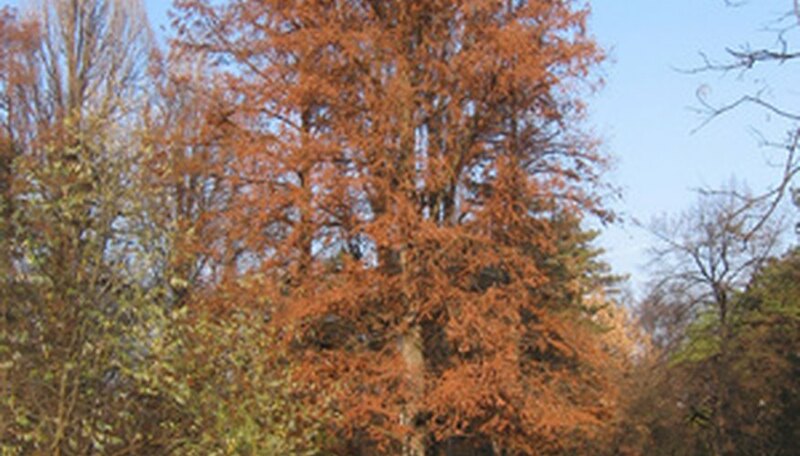 Do consider trees with fall foliage color that does not match that of the bald cypress. Look for trees with bright yellow, purplish-burgundy or fiery red leaves that will contrast the rusty orange needles. By combining both contrasting growth habits and foliage, you can also add trees that produce seasonal flowers into consideration to complement the bald cypress in the landscape. Star, saucer and sweet bay magnolias (Magnolia spp. ), crab apples (Malus spp. ), hawthorns (Crataegus spp.) and crape myrtles (Lagerstroemia) have dissimilar habits and foliage and bear colorful flowers that a bald cypress never displays. Trees that subsequently produce persistent fruits also contrasts the fall foliage and barren bald cypress branches in early and midwinter.